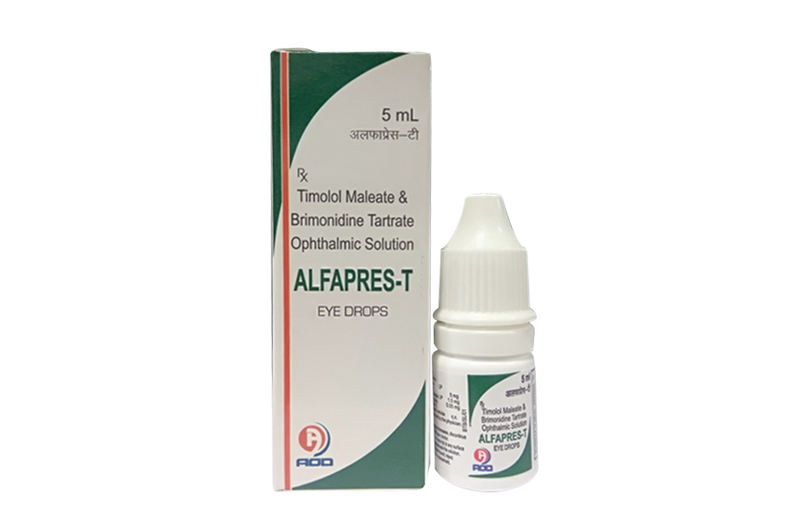 Alphapres-T Eye Drops is a relatively selective alpha-2 adrenergic receptor agonist with a non-selective beta-adrenergic receptor inhibitor (topical intraocular pressure lowering agent). This combination medication is used to treat high pressure inside the eye due to glaucoma (open-angle type) or other eye diseases (e.g., ocular hypertension). Lowering high pressure inside the eye helps to prevent blindness. Alphapres-T Eye Drops is an alpha-adrenergic receptor agonist with a beta-adrenergic receptor inhibitor indicated for the reduction of elevated intraocular pressure (IOP) in patients with glaucoma or ocular hypertension, who require adjunctive or replacement therapy due to inadequately controlled IOP; the IOP-lowering of Alphapres-T Eye Drops. Alphapres-T Eye Drops are contraindicated in patients with hypersensitivity to any component of this medication, in patients receiving monoamine oxidase (MAO) inhibitor therapy, in patients with bronchospasm, bronchial asthma or patients with a history of bronchial asthma, or severe chronic obstructive pulmonary disease, in patients with sinus bradycardia, sick sinus syndrome, sinoatrial nodal block,second or third degree atrioventricular block not controlled with a pacemaker, overt cardiac failure or cardiogenic shock. The recommended dose is one drop of Alphapres-T Eye Drops in the affected eye(s) twice daily approximately 12 hours apart. If more than one topical ophthalmic product is to be used, the different products should be instilled at least 5 minutes apart. One White Lupolene bottle packed with printed labeled in a unit carton and, Such 25 Carton Packed in a Shrink Sleeves.Such 12 shrinks packed in a shipper.